I think the longest 11 minutes I ever experienced in my life were those 11 minutes on the evening of Jan. 3, 2004. I, along with other members of the Mars Exploration Rover science team, were assembled in our science operations working group meeting room at the Jet Propulsion Lab in Pasadena, Calif., awaiting the landing of the rover Spirit in Gusev Crater. We had been listening with anticipation as the mission engineers reported on Spirit’s progress in its passage through the Martian atmosphere. Described to the press as “six minutes of terror,” Spirit apparently had survived that perilous journey with flying colors. In fact, the rover had just sent back a signal saying that its airbag landing system had deployed and that it was bouncing, but then… silence. Heavy on all our minds were the recent failure of the Beagle 2 lander and the twin failures in 1999 of the Mars Polar Lander and the Mars Climate Orbiter. We had all invested so much time and energy in these two rovers that to lose them was unthinkable. So we waited, and waited, and then… Success! A signal was received that Spirit had rolled to a stop and was safe. An adventure that science principal investigator Steve Squyres of Cornell University in New York has called “the first great mission of exploration of the 21st Century” was ready to begin. And what an adventure it has been for those of us who have been working with the rovers on a daily basis. While living and working on Earth, we were working and sleeping on the same time scale that the rovers followed. This meant extending our days by 39.24 minutes to match the length of the Martian day. So we would sometimes sleep during the sunlight hours on Earth, come into JPL and greet our co-workers with a chipper “good morning” at 9 p.m. Pacific time. Checkout of Spirit’s systems proceeded apace and we were delighted with the images of the interior plains of Gusev Crater that were spread out around Spirit and its landing platform. Much to our surprise and delight, visible on the horizon were the hills that we would come to call the Columbia Hills in honor of the Columbia space shuttle astronauts. The hills seemed tantalizingly close and yet frustratingly far away. The mission success goal for the rovers was for each of them to drive 600 meters, or 1,968 feet, and the hills were over two kilometers, or 1.24 miles away. Little did we know at the start of the mission how sturdy Spirit would prove to be. For a heart-stopping series of days, though, we feared that Spirit’s mission might end before it really began. Just as Spirit was poised to make its first in situ measurements on the pyramidal rock “Adirondack,” it suffered a serious “anomaly” — “anomaly” being engineer-speak for an “oh no!” problem — which proved to caused by Spirit “overfeeding” on data and loading its flash memory past capacity. The engineers worked through the problem, but as they struggled with Spirit’s glitch another small issue had to be dealt with — the landing of Spirit’s twin rover, Opportunity. On Jan. 24, Spirit’s picture-perfect landing was mirrored by the equally successful landing of its sister on the flat plains of Meridani Planum, located on the other side of the planet. 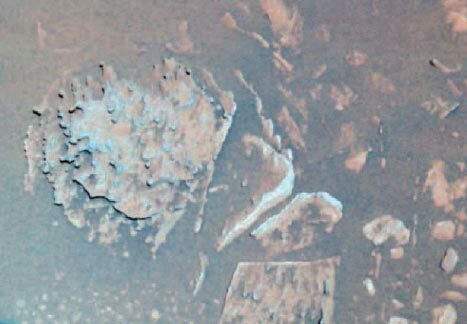 While the first images we had received from Spirit had made us happy, those we received from Opportunity made geologists such as myself ecstatic because in an extraordinary “hole in one,” Opportunity’s airbag bounce and roll had deposited it in a small 22-meter (72-foot) diameter crater. Even better, there in front of the rover was in-place bedrock. All previous Mars landers had seen plenty of rocks to be sure, but they had all been out-of-place rocks transported from their source regions by impacts or floods. As we studied the images of the “Opportunity Ledge” outcrop that came in from the rover’s color Panoramic Camera, or Pancam, and initial thermal infrared measurements of it by its “mini-TES” thermal emission spectrometer, we began to realize that there before Opportunity was what we had come to Mars to find: rocks that by all initial indications were sedimentary in nature. 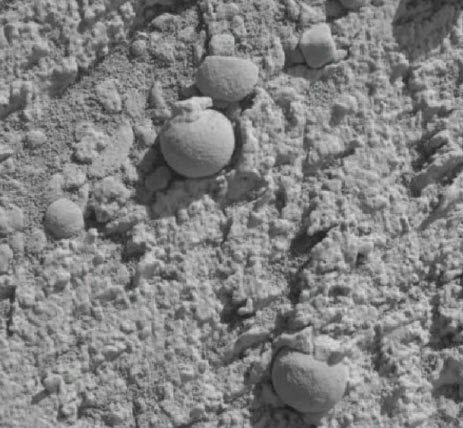 Opportunity’s Pancam of the small, round pellets, nick-named “blueberries,” scattered on the ground near the Shoemaker’s Patio rock outcrop in Eagle Crater. The mystery of the blueberries took a back seat to the allure of the Opportunity Ledge outcrop. A field geologist will scratch or break a rock to obtain a fresh surface and take a close-up look at the rock texture with a magnifying lens. Opportunity and Spirit were equipped to do much the same thing. Hence when Opportunity made its first measurements of the mysterious light-toned rocks exposed in the inner walls of Eagle Crater, it took a close-up look with the rover’s Microscopic Imager, obtained a fresh surface by grinding into the rock with the Rock Abrasion Tool (RAT), and “sniffing” the rock — examining its chemical and iron-bearing mineral composition — with its Alpha Particle X- Ray Spectrometer (APXS) and Mössbauer spectrometer. The first up-close views of the outcrop indicated that the blueberries were, in fact, weathering out of the outcrop. Moreover, that rock provided yet another set of surprises. First, chemical analysis of the outcrop by the APXS indicated that it was richer in sulfur — up to 40 percent sulfate minerals — than any rock or soil yet analyzed on Mars. The first measurements by the Mössbauer spectrometer provided perhaps an even bigger surprise since they indicated that the outcrop was filled with the mineral jarosite, a hydrated iron sulfate mineral that, on Earth, always forms in the presence of water. So, to use mixed sports metaphors, Opportunity’s “hole in one” at Eagle Crater led to a “home run” with its discovery of rocks formed in water. 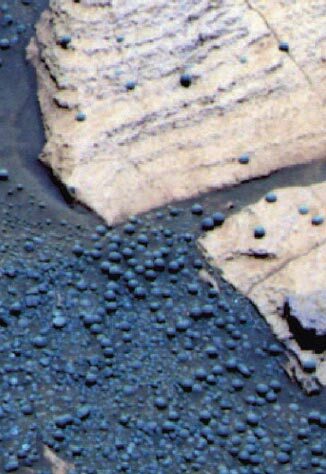 Microscopic Imager view of “blueberries” weathering out from the outcrop rock found at Eagle and Endurance. The blueberries are, on average, about 5 millimeters in diameter. While Opportunity was busy analyzing the rocks of the Opportunity Ledge outcrop, Spirit, after having been cured of its case of “over eating” on data, was proving to be the long distance voyager of the twin rovers. It rolled across the plains of Gusev Crater to the nearly 200-meter (656-foot) diameter Bonneville Crater, stopping along the way to do its own analysis of rocks and soils. What Spirit found were dark rocks with the composition of basalt — no big surprise there since the presence of basalt on the surface of Mars had been indicated by telescopic observations and measurements by the orbiting Thermal Emission Spectrometer (TES) on-board the Mars Global Surveyor spacecraft. The soil also had an overall basaltic composition, but the Mössbauer spectrometer indicated that it had abundant olivine, a mineral that rapidly breaks down in the presence of water. 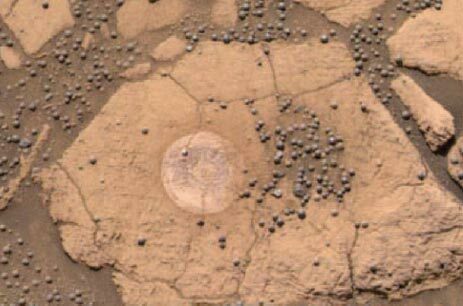 While Opportunity’s examination of the rocks outcropping in Eagle Crater had confirmed the presence of jarosite, the multispectral Pancam imagery also indicated the presence of red hematite, the finer grained cousin of the coarse grained gray hematite that had been the reason that Meridiani Planum was chosen as a rover landing site. The host of the gray hematite, detected from orbit by the TES instrument, remained a mystery until Opportunity was able to take a close-up look at a concentration of “blueberries” in a feature named, appropriately enough, “the Berry Bowl.” Measurements by the spectrometers onboard Opportunity indicated that the berries were composed largely of gray hematite. 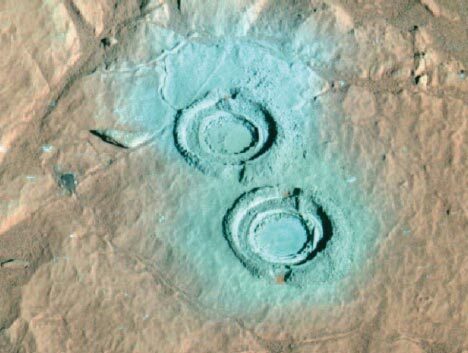 This seemed to indicate that they were actually “iron concretions,” — nodules formed by the secondary circulation of fluids within sedimentary rock outcrops. While such concretions are not necessarily rare on Earth, they are not found in the abundance that is apparent on the plains of Meridiani Planum. A look inside “the Berry Bowl,” where the Mars team did a detailed in-situ examination of the odd formations. Initial examination of the Opportunity Ledge outcrop in color and high-resolution stereo imagery had revealed distinct layering. It took closer examination, and a search for the best examples, to confirm that in addition to minerals formed in water (which quite plausibly could have formed by the circulation of ground waters), the layers in these rocks formed distinct cross beds in places. Cross bedding is a form of sedimentary structure produced by the movement of sediments by water or winds. The cross beds observed in the Opportunity Ledge outcrop had structures deemed distinctive of movement by water — confirming to many of my colleagues that these rocks had formed in a long- gone standing body of water and were, in fact, evaporates. Evaporates are rocks formed by the evaporation of ancient lakes or seas and the resulting concentration of salts and related minerals into sediments and consequently, rocks. In essence, Opportunity had succeeded in its mission — finding evidence of the sustained action of water at the surface of Mars. Thus, potentially, finding evidence of an environment where life would have had the ingredients, and the time, to come into being and, for a time, prosper. While the explorations of Opportunity of Eagle Crater had been fruitful, other parts of the Meridiani plains beckoned. Thus after 56 Martian days, or sols, exploring Eagle Crater, Opportunity emerged from the crater, started across the plains to the larger (150 meter in diameter) Endurance Crater which lay 800 meters to the east of Opportunity’s landing site. After 39 sols of roving across the exceedingly flat plains of Meridiani Planum, with several significant science stops along the way, the rover reached the western rim of Endurance Crater (informally named in recognition of Antarctic explorer Ernest Shackleton’s ship) and was rewarded with a spectacular vista. While Opportunity had spent nearly 56 sols examining only about a meter’s thickness of outcrop, the walls of Endurance crater had more than 10 meters of outcrop. Opportunity’s exploration of Endurance began with a partial circumnavigation of the outer rim of the crater, with two stops for panoramic imaging of the crater interior. At the same time, engineers were performing computer simulations and physical trials with a test bed rover to see if Opportunity could safely descend into the crater (and later drive out) and begin to sample those outcrop layers directly. Eventually, the decision was reached, and a location found, that was deemed safe for the rover to drive in and its sampling of the layering in Endurance began. A composite view of Endurance Crater taken by cameras on Opportunity. Meanwhile, on the other side of the planet, Spirit’s long traverse across the plains of Gusev Crater had been successful. Along the way, Spirit had found tantalizing hints of the action of water: rocks with fractures and veins potentially affected by water, rounded pebbles armoring dunes, layered coatings on basaltic rocks. However, no “smoking gun” to compare with the cross-bedded, sulfate-rich rocks found by Opportunity had yet been found by Spirit. Each rock examined by Spirit was found to be variations on a theme of basalt. However, all that was to change when Spirit finally reached the Columbia Hills. Upon reaching the base of the hills, Spirit found a unique set of rocks with an odd “inside out” form of weathering (Fig. 5). Analysis of these rocks revealed that it had a generally basaltic composition, but that it also had a mineral common at Meridiani Planum-hematite. These rocks with unique names such as “Pot of Gold” and “Breadbox” have been deemed as very likely being altered by the action of water. Spirit’s Pancam images “Pot of Gold,” a rock found at the base of the Columbia Hills that displays a distinctive weathering pattern. Scientists believe it is the product of aqueous alteration processes. Spirit’s journey had been long and hard and while the “promised land” of the Columbia Hills was at hand, Martian winter was approaching and with that change of season, the effects of shorter days and lower sun angles led to the solar powered rover’s power situation getting worse and worse. Adding to the difficulties, Spirit’s drive had exceeded its tested “warranty” and its right front wheel showed symptoms of overuse. Recent drives have been done backward, using five of the rover’s six wheels in order to preserve what is considered a limited number of rotations before the wheel becomes locked in place. The fact that Spirit has reached the Columbia Hills is actually fortuitous for the energy situation since, by driving up onto north facing slopes of the hills, Spirit is placed in a more favorable angle for solar charging given Spirit’s location in the southern hemisphere. With the improved energy situation Spirit is poised to continue its exploration of the Columbia Hills. That exploration continues to be interesting because as of Sol 190 of the mission, Spirit had finally matched its twin rover by finally finding bedrock! While the exact nature of that bedrock still is in doubt, it is clearly not the same type of dark basalt found out on the plains. The material is softer and lighter in color than the color than the volcanic rocks littering the plains. Further examination of the rocks making up the Columbia Hills should provide more information on the history of water in Gusev Crater. Spirit looks at two holes it carved into the rock “Clovis,” located on the west spur of the Columbia Hills. The rock exposed in the Columbia Hills is lighter in tone and is softer than that which was examined out on the plains of Gusev Crater. While Spirit had found nothing but dark rocks until reaching the Columbia Hills, the only in-place rocks found by Opportunity have been variations on a theme of the light-toned rocks first seen in Eagle Crater. However, in situ examination of the layers making up the walls of Endurance Crater have provided important chemical details that should eventually provide a better picture of the history of water at Meridiani Planum. Opportunity has now left Endurance Crater to continue its exploration of the Meridiani plains. Opportunity looks at the Burns Cliff portion of the walls of Endurance crater. The image is a Pancam composite. Note: All the Pancam images use colors that are close to what the human eye sees, with the exception that the red band is centered at a slightly longer wavelength than what we see. Contrast in the images has been stretched to accentuate their colors. Some images are false color to accentuate details. Spirit and Opportunity have far surpassed the expectations that any of us had before they landed nearly one year ago. They have transformed our view of Mars from single views from isolated locations to real, changing landscapes filled with a surprising variety of rocks, soils and skies sometimes peppered with clouds. They have also given us evidence that Mars was once a much difference place with salty, probably acidic, seas. Whether life ever formed in those waters is a question that will have to be resolved by future missions, but the Mars Exploration Rovers have given us the spirit to proceed. Now we must seize the opportunity and continue the exploration of our fascinating neighbor in the solar system. National Space Society member Bill Farrand is a research scientist with the Space Science Institute in Boulder, Colo., and a member of the Mars Exploration Rover science team.